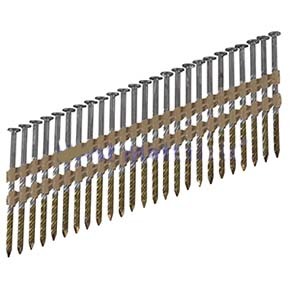 PRODUCT: 2-1/4" x .113" Framing Nail, Steelhead #ST7D113SHD ASTM A153 Hot Galvanized Dipped SPIRAL / SCREW Shank, 9/32" Full Round Box Head 20-22 Degree Plastic Collated 5000/Box. Price/Box. APPLICATIONS: Fiber Cement Siding, etc.